Entered Navy in 1866, Transferred to Army in 1874. Distinguished career as a cavalry officer. Commanded cavalry in Boer War. Promoted Field Marshal 1913. Chief of Imperial General Staff 1912-1914. Commander in Chief British Expeditionary Force (BEF) 1914. Moved the BEF to France in the opening days of the War. Expected to join the French army in offensive operations on concentration in August. Instead the BEF was attacked by superior German forces from the right wing of the massive German wheel through Belgium. Desperate battles at Mons and Le Cateau. Orders retreat of the BEF, Informs his staff of his intention to withdraw the BEF from the battle line to refit south of the River Seine. Lord Kitchener, the Secretary of State for was travels to Paris and directs French to support the French forces in their battle with the advancing Germans. The BEF retreats south of the Marne, then turns around and attacks. This attack was critical in forcing the Germans to retreat to the Aisne River (Battle of the Marne). French continues as Commander in Chief of the BEF, through the critical battles in the northwest where the Germans attempt to break the allied defenses at Ypres. This battle spelled the end of the "Old Contemptibles", the original BEF. Continues in command of the BEF until September 1915. During that time the BEF conducts attack the German line at Neuve Chappelle in March. Defends itself against a major German attach at Ypres, where the Germans use poison gas for the first time on the Western Front. Conducts two more major offensive operations at Festaburt and Loos. Each of these attacks is a failure, with constantly increasing casualties with little success. French blames the high command for shortages of high explosive shell. 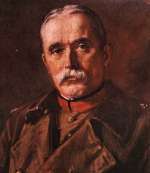 His subordinates, particularly Gen. Haig, the First Army commander, blames French. French is relieved of his command, September 1915. Lord Lieutenant of Ireland 1918-1921.